It’s Tuesday Push time again, this week seeing WhatClinic.com get a nudge – and well worth it too. I first heard of WhatClinic when it was announced they had secured a â‚¬1.25m round of funding through Mianach Venture Captial, supported by Enterprise Ireland as a HPSU. That was back in January, when at the time the site currently had information on over 60,000 clincs in the UK, Ireland and 50 other countries worldwide. The site helps people take control of their healthcare choices and find the moist suitable clinic and treatment for their needs. At BizCamp Dublin back in March I sat in on the talk shared by Johnny Beirne and Caelen King where those of us in attendance were treated to an insight of the development of WhatClinic.com, the ups and downs of changing the design and function of your company’s website, where the site aims to generate revenue and what it can do for those seeking healthcare options. Caelen also recently presented at BarCamp Belfast (where I still haven’t managed to shift my thoughts from the notepad to the screen) on monitising your web applications, which you can see below. 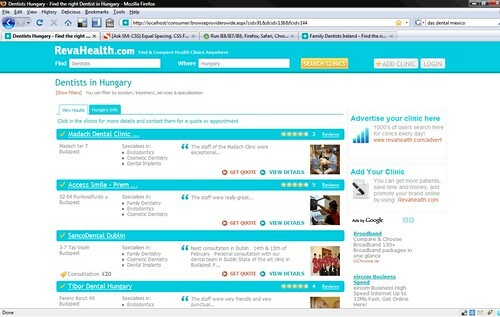 If you’re looking for a dentist in dublin, a cosmetic clinic in Galway, or plastic surgery clinics in Ireland, you’ll find them on WhatClinic.com. Clinics and providers can also sign up for free and setup a WhatClinic brochure. For additional services to boost your profile online there is also a premium-level â‚¬50p/m option to help you get even more patients, access a patient management system and brand your brochure in your own style (removing third-party branding). You can also follow WhatClinic on Twitter here.